(VOVWORLD) - President Tran Dai Quang on Tuesday hosted a reception for newly-accredited ambassadors of Chile, the UK, Poland, Gambia, and Uganda. 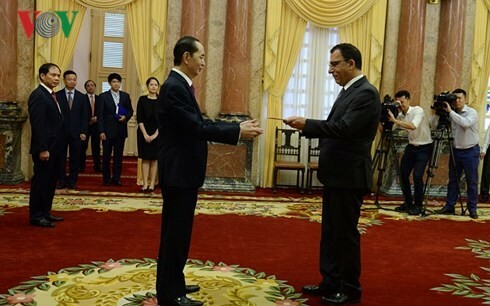 Chilean Ambassador Jaime Chomali Garib presents his credentials to President Tran Dai Quang on August 7, 2018. President Quang told Chilean Ambassador Jaime Chomali Garib that Vietnam and Chile should deepen their comprehensive partnership and mutual support at multilateral forums. Ambassador Garib called for an early ratification of the Comprehensive and Progressive Agreement for Trans-Pacific Partnership that both countries have signed. President Tran Dai Quang and British Ambassador Gareth Ward. 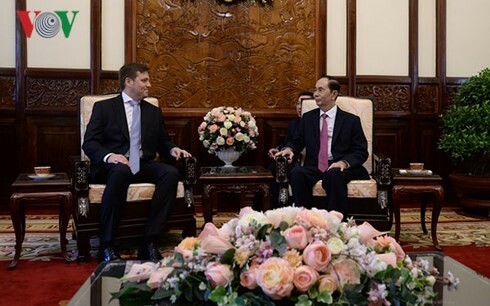 Meeting British Ambassador Gareth Ward and Polish Ambassador Wojcieh Gerwel, the Vietnamese President asked for the two countries’ support for the signing of the EU-Vietnam Free Trade Agreement within 2018. Ambassador Ward said that the UK strongly backs the EU trade pact with Vietnam and wants to strengthen cooperation with the Southeast Asian country. He reiterated the UK’s constant support for freedom of navigation and overflight on the basis of international law. 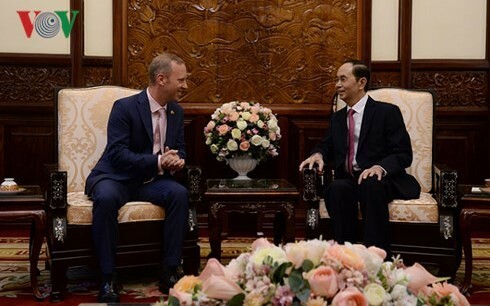 President Tran Dai Quang receives Polish Ambassador Wojcieh Gerwel. President Tran Dai Quang and Gambian Ambassador Ramzia Diab Ghanim. Receiving Gambian Ambassador Ramzia Diab Ghanim, President Quang called on Gambia to support Vietnam’s bid for a non-permanent seat at the UN Security Council in the 2020-2021 tenure. He proposed the two countries sign agreements on trade and investment and visa exemption for diplomatic and official passport holders. 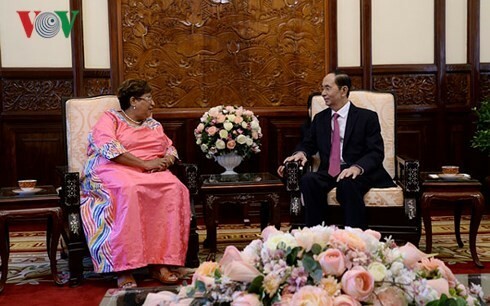 President Tran Dai Quang meets Ugandan Ambassador Dorothy Samali Hyunha. 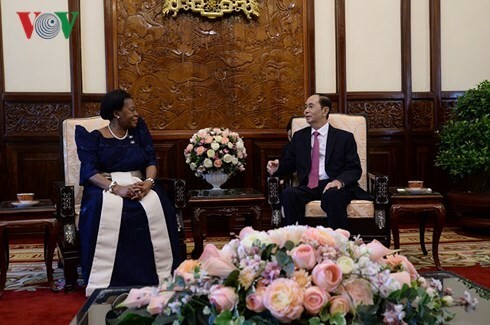 Mr. Quang told Ugandan Ambassador Dorothy Samali Hyunha that Vietnam is ready to share experience with her country in agriculture, fisheries and construction. VOV VOVworld President Tran Dai Quang reception newly-accredited ambassadors Chile the UK Poland Gambia Uganda.